If my knowledge of Polish names is a guide, this name is not Polish, according to the best data available there were no Polish citizens with any name beginning with Mazas except for 7 named MAZASZ living somewhere in Opole province and 4 named MAZAS living somewhere in Lublin province. Actually at first I thought the name might be a varient of a Lithuanian name ending in -aitis, which means 'son of' .Unfortunately a look at the 2 volume Dictionary of Lithuanian surnames shows no name beginning with Mazas. Of course names from Eastern Europe were often mangled badly past all recognition during the course of resettling in new countries. There's no guarantee the original name was anything like MAZASITISZ. Still if that's all you have to work with, you will have to look for clues where you can. In general it's a mistake to concentrate on a surname and try to figure anything from it. 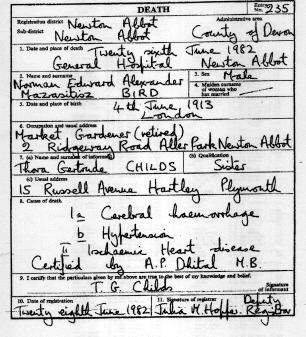 Usually it's more productive to dig and dig furiously for documents dealing with your particular ancestors, Of course, it may be that this name is very rare, so if you DO find anything on it this information will help you a lot. Perhaps the name was taken from Masuria the English name for the area called Mazury in Polish. The area used to be a part of Prussia and of the administrative region of East Prussia. Morris Powell (Mazasitisz] was from Prussia according to the New York Census. Polish settlers were called Mazurs, in the 15th Century the original Prussian population were exterminated and the Prussian language suffered a decline. The name Masuria began to be used officially after administrative reforms after 1818. Mazasitisz - perhaps 'son of' the area? The most likely explanation for the name change was that Harry was a Conscientious Objector and had to flee London at the start of WW1 and move around the country. He reverted back to Harry Bird in 1923 possibly when it was safe to do so. We have no idea how the family managed financially throughout the war years with so many young children to support. why he was named after Dorothy's father?